Can you tell if a shop owner loves what she sells? 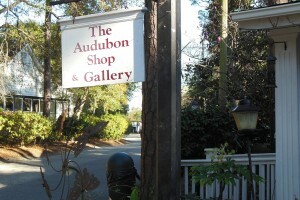 At The Audubon Shop and Gallery in Pawleys Island, SC, you think – maybe so. Small business owner Diane Rastello tells you her brother said, “Don’t just buy what you like, you’ll never sell it.” Rastello didn’t take it as an insult. She laughed. But today a tear appeared – her brother died, too young, last year. For Rastello, the shop is more than being surrounded by things you love (and things you think others might love), it’s a 7-day a week avocation. Maybe that’s what it takes to make it in retail business today. According to the Small Business Administration, less than 29% of all small businesses are owned by women. About 50% of all small businesses fail in the first five years, and only 33% survive 10 or more years. Those are tough odds. This is Rastello’s 13th year. Before moving to South Carolina to live near her brother, solo Rastello never imagined she’d be a small business owner. She was Executive Assistant for Sears Roebucks’ Midwest Distribution Center in Columbus, OH. She thought she would be corporate forever. That was 16 years ago. Then she lost her job. “I loved the beach, had no husband or kids, and decided to move near my baby brother,” Rastello said. Now she’s the mecca, her parents and sister have since moved here. When she first arrived in this resort area, Rastello worked three jobs, one was in the Audubon Shop. She enjoyed it. “I love nature, and gardening and birds,” she said. So when the owner seemed interested in selling, Rastello decided to take a chance. She did what she had to do, and added a bit of what she wanted to do. She changed the merchandise mix some, adding more local artists, fewer typical souvenirs that you can buy in other shops. 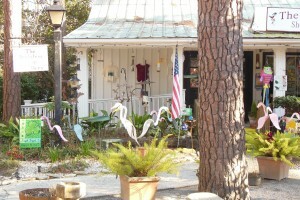 A carved egret. 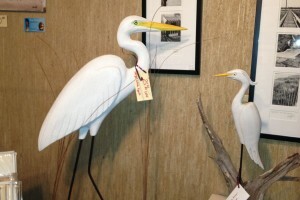 After writing about egrets in a previous story, and quoting Audubon experts, Rastello’s shop drew me in immediately. Rastello still works hard to buy things for the shop that are unique, hence the name, Shop and Gallery. 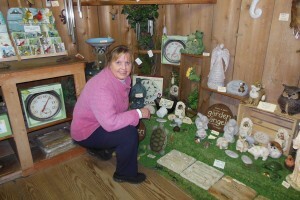 She buys from about 350 companies, plus local crafts people and artisans. She said once you register to have a retail license, “reps for companies come out of the walls. 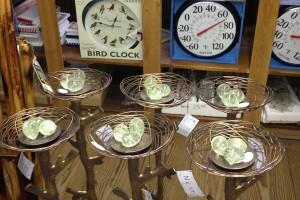 They call, come in, they find you.” She also goes to a wholesale market once a year to see new items. She’d like to go to the big ones in Atlanta and Dallas, but she admits she can’t afford it. She’s practical, maybe that’s why she’s made it in business for 13 years when so many others fail. Rastello checks the inventory on a daily basis by walking around the shop and seeing what’s left on the shelves. She reorders and restocks whenever sees empty places on the shelves and displays. She’s very hands-on. She has to be. Five years ago, she had three employees. 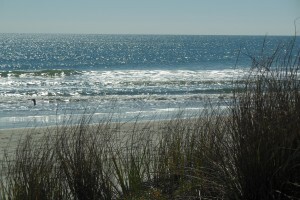 The recession has affected tourism and purchasing power significantly in this area. The economy is still hurting, hence Rastello’s seven-day-a-week commitment. Does she have a chance to enjoy the nature she moved here to experience? Rastello said she walks Huntington Beach State Park most mornings before opening the shop. And her eyes lit up when she talked about the local loggerhead turtle population. For 13 years, this small business owner in Pawleys Island, SC, has successfully walked the line between what she likes and what she thinks others may like. But having the shop is about more than moving merchandise. Rastello said she loves meeting people and connecting with old friends. “Sometimes an old coach or someone I knew or worked with will be vacationing in the area and come into the shop and there’s that moment of surprise, recognition, and reconnection. I love that,” she said. 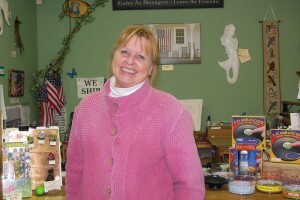 Rastello has weathered a lot of ups and downs, the economy, the death of her brother and of her beloved dog, Putter, a fixture at the shop for many years, about whom she’s written a book. But like the waves in the sea, ups and downs are the flow of life. What’s next for Rastello? Right now, approaching spring, and a new tourist season. February 21. Story and photos by Bojinka Bishop.